"Longwood’s bonsai are under constant training and maintenance. Longwood in Pennsylvania choses to have as many bonsai on display as possible on any given day. You will view some bonsai in perfect order and some in various stages of training. We hope you enjoy seeing the pruning and wiring techniques that are used to create these magnificent specimens." 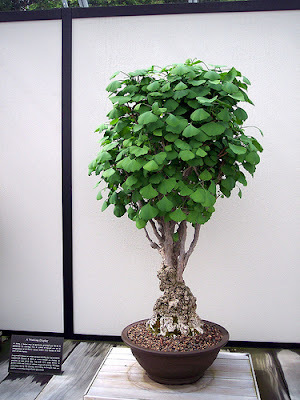 I found this splendid Ginkgo bonsai photo on this blog. "A little over a month ago, in the early days of December, I encountered a wave of color in the mountains of central Honshu that I miss in Hokkaido: the delightful, dreamy gold of ginkgo (icho) leaves. By now, that particularly beautiful wave must be reaching its southern limits, perhaps even petering out toward the southwestern region of Honshu." * Added X-ray image of Ginkgo biloba leaf venation. 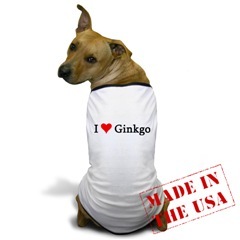 This I Love Ginkgo Dog T-shirt is one of the many "I Love Ginkgo" products I found here. * Added photos I made of Ginkgo trees in France, Luxembourg, Belgium and Denmark. "Signor Moscardini especially enjoys walking among the Ginkgo trees at the Robie House. Yes, we know the hand is showing, but Sr. Moscardini is very open-minded, as well as open-ended." * New photo photospecial page: Ginkgo trees in Berlin, Germany. The ginkgo nut is a hard shelled kernel/nut from the maidenhair tree commonly known as the ginkgo biloba, which is an ancient plant. Traditionally a Chinese food. It is said that this nut brings good luck. Added to most sweet and savory dishes. Often sold as an alternative to the lotus seeds in “eight treasure dishes”. They are very popular in Japan and Korea. They are threaded onto pine needles then grilled and salted. The ginkgo nut has high starch content, and a low fat content. Widely used in Asian cooking. Their texture is that of a soybean. They have a slightly sweet flavor. They are often used in stuffing, soups, desserts, meat and poultry dishes as well as many vegetarian dishes. The ginkgo trees are considered scarce in China. The seeds are available canned, sold as "White Nuts", and can be found in many Asian food stores in the West, they also sold dried, or shelled and canned in brine. If purchased in the dry form, they must be shelled at home and then blanched. When buying the canned form, they should be rinsed of their brine before use. The nuts are seasonal and not easy to find in their fresh form year round. A fresh variety is available in the fall and winter months. Popularity is growing in the United States but is not too widespread because Americans are not very familiar with the culinary uses of this particular nut.. May be found in special markets, or your regular grocery store, year round. How to store: These nuts will keep well unshelled; once they are shelled they only keep a short time refrigerated. How to prepare: To use the nuts; soak the kernels in hot water to loosen the skins off. Cook till they are a delicate shade of green.